I can't think of a time when I've ever agreed with Cal Thomas. I confess I don't seek him out, but when I see him on an occasional Op-Ed page I'll read him just to see what he's going to say that's going to infuriate me. I'm rarely disappointed. 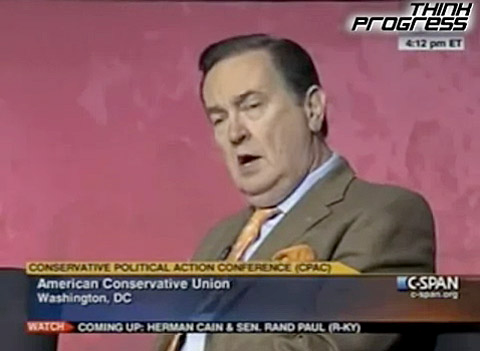 So as he sat on a panel at this year's CPAC and said what he said about Rachel Maddow, I wasn't shocked. He was at CPAC with his own peeps. It was cool. During a panel at the conference, a clip of Maddow's appearance on Sunday's "Meet the Press" was played. In it, Maddow said that Republicans are "waging war on contraception." "I'm really glad...that you played the Rachel Maddow clip," Thomas said after the audience booed a bit, "because I think that she is the best argument in favor of her parents using contraception." As the audience cheered, he continued, "I would be all for that and all the rest of the crowd at MSNBC too for that matter." Then last week Rachel announced that Cal Thomas had called her to apologize. She told her audience, "I completely believe his apology. I completely accept his apology." Good. Classy. He talked about that day when he sat on the panel and watched a projection of a Rachel Maddow Show clip as she talked about the Catholic contraception controversy. He did not and cannot deny that he said what he said: "I think she's the best argument in favor of her parents using contraception." In his column he wrote, "I was asked to be on a panel before what looked like a crowd of about 1,000 conservatives, hungry for "red meat." He wrote that he "stupidly" said what he said "before thinking". "Without engaging in any qualifiers, she is a strong and competent advocate for her position. Why do so many of us only watch programs that reinforce what we already believe? Where is the growth in that? Whatever else she may or may not be, she is my fellow American. I have many liberal friends acquired over the years. They are impossible to avoid in the media, but I don't wish to avoid them. They became my friends because I stopped seeing them as labels and began seeing them as persons with innate worth. That is what I failed to do in my first response to Rachel Maddow. . .
. . .I expect to like Rachel Maddow because my instinct is to separate the value of a person from his or her political position. For some strange reason (demon possession, perhaps) I failed to do that at CPAC." Bravo, Mr. Thomas. You will lose friends and followers over this, and it will probably be no comfort to you that I, as a liberal, completely believe your apology and appreciate what you've done here. But none of that is important. What is important is that the next morning you felt bad about what you had done and you "called Ms. Maddow to apologize. It wasn't one of those meaningless 'if I've offended anyone...' apologies; it was hearfelt." And by doing that and writing about it publicly you've opened the doors for all of us to remember something we so easily forget when we're in the midst of doing battle with the people on "the other side": Whatever else we may or may not be, we are fellow Americans. Well, it is a human failing of our evolved brains , culture and modes of thinking which causes us to ignore, dismiss or ruthlessly attack dissenting information and prop-up, seek out and defend any view which conforms to our pre-conceived notions. However, CPAC and the last few decades has seen the creation of an Alternate Conservative Reality Matrix which seeks to cash and reinforce the right-wingers ignorant untruths. Cal Thomas no matter what he writes today will be back pushing the lies of the right tomorrow. Followed you over from Brilliant at Breakfast! Hey, Grung, thanks for stopping by. LOVE BaB! It could be that Cal Thomas will go back to being Mean 'Ol Cal, but this one moment was so out of character for him and so outside the actions of every other vocal member of his club I just couldn't let it pass. I really was moved by his honesty and his gracious words about Rachel. He didn't have to do it but he did. To say I was flabbergasted is a huge understatement. Color me...stunned. I'm no fan of Cal Thomas, but I give him great credit for showing some real class. That seems to be in short supply these days (on both sides, but come on...you see it more on the right, no doubt about it), and I'm impressed that he was self-aware enough to realize that he'd been a real jackass. I confess I haven't kept up with Cal and haven't read any later columns, but maybe I don't really want to because I still can't get over this. Honestly, it really did make me think the tide is turning and prominent Republicans are finally beginning to understand what all that hate is doing to their party. Now if we could just skunk them on November, they'd get the message loud and clear.